Arborjet updated the label of Phospho-jet, a systemic fungicide and plant resistance activator for the suppression of various plant diseases. The updated Phospho-jet label allows for additional application methods such as bark sprays, foliar sprays, drenches, root dips and new instructions for use in hydroponic systems. The formulation of the product remains the same. The Phospho-jet label lists a number of new use sites for the product, including apples; crab apples; loquats; pears; quinces; avocados; mature citrus trees; coconuts; berries; mangos; stone fruit; tree nuts; seed treatment applications; grass grown for seed production; landscape, golf course, nursery, forestry and park applications; ornamental applications; nursery and bedding plants; turf; turf tank mixtures; and conifers in commercial nurseries, plantations and forests (including Christmas trees). 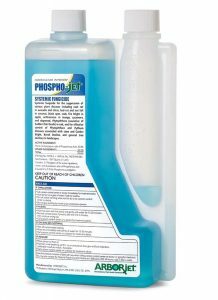 Phospho-jet is available in 1-liter containers and in case quantities. One liter of Phospho-jet treats 20 trees (10-in. diameter at breast height).